Tracey Cooper, CEO of Public Health Wales, a division of the National Health Service, identified an opportunity to further improve the effectiveness of the organisation by bringing 550 staff located in 10 offices around South Wales together into one building. The design, supply and installation for Public Health Wales Cardiff was awarded to a consortium led by Rype Office (responsible for design, furniture supply, installation and project management) with its partners Greenstream Flooring (flooring supply and installation) and Orangebox (new soft furnishings and remanufactured desk chair supply). In addition to formal bookable meeting rooms, informal breakout spaces were incorporated into every team, furnished to suit the team’s collaborative style. These encourage ad hoc discussions without the formality of booking a room or the disturbance to neighbours of at-desk conversations. The canteen contains a variety of seating options to increase its utilisation and amenity by creating additional informal collaboration spaces. Four booths enable semi-private meetings for up to six people, four-person tables enable small group discussions, and 14-person communal dining tables encourage chance interactions. A dedicated innovation room, with high-energy colours, has been designed for the co-creation process, with a focal point (a giant sofa facing a screen and whiteboards) to discuss the problem at hand, small group settings (cabaret-style tables with funky seating) for ideas to be discussed and developed, which can then be brought back into a plenary session at the focal point. Wingback chairs, located at either end of the atrium on every floor, allow one-to-one conversations or phone calls to colleagues. 94% of the over 2,500 items of furniture for Public Health Wales Cardiff were either remanufactured or refurbished. Some of the refurbished furniture came from PHW’s 10 old offices, integrated into the design by matching timber finishes and desk shapes. Remanufacturing/refurbishing reduces the environmental footprint of an item by 80% compared to new and avoids disposal to landfill; WRAP estimates that 300 tonnes of office furniture goes to landfill every working day in the UK. 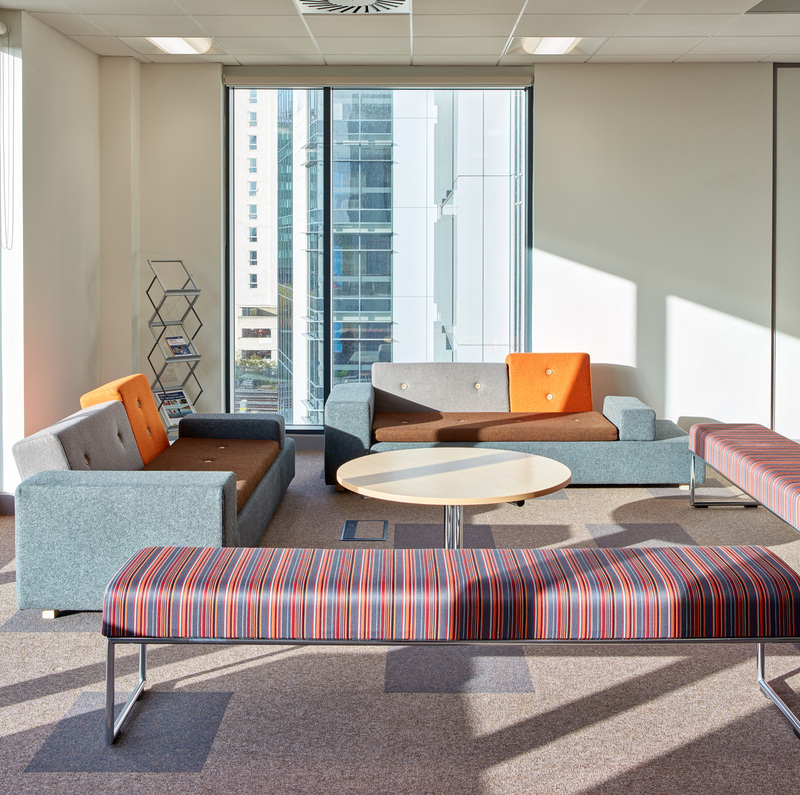 The 6% new furniture was made in South Wales by local furniture manufacturers including Orangebox, who provided the wingback chairs and team collaboration booths. 13% of the 5,200m2 of carpet tiles were reused. These came from corners of rooms and under desks, cabinets and equipment so had limited wear. The new carpet tiles used were British-manufactured BREEAM A+ heavy contract carpet tiles. Remanufacturing and refurbishment occurred on site to reduce transport and enable Welsh employment. Eight unemployed with disabilities from the South Wales valleys were engaged for the project, including two youths. Five were trained in furniture refurbishment and reupholstering as well as furniture removals and truck load management. Three were trained in flooring reclamation, logistics and fitting. Kitchens were designed for disability and follow the design guidelines of the Royal National Institute for the Blind. 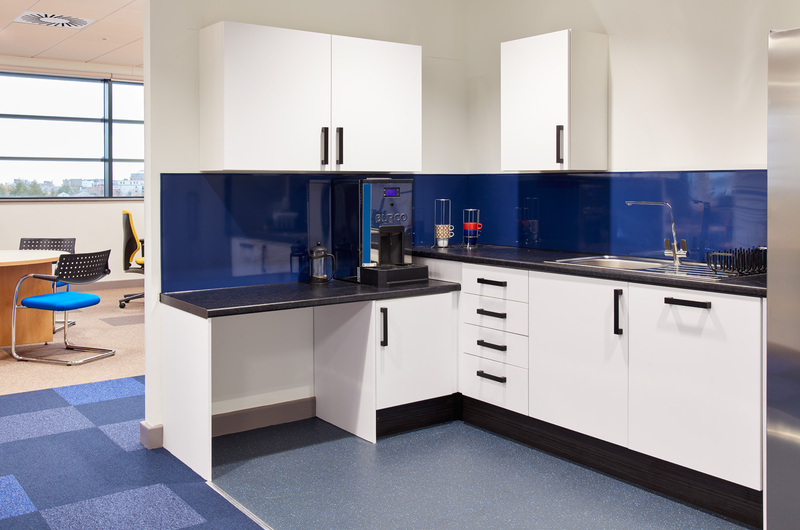 Floors, kicker plates, cupboards, handles, benchtops and splashbacks in alternating light and dark provide strong visual contrast assisting the sight impaired. Large handles improve operability. Flooring colours were chosen so walkways differ from team spaces and edge strips by as many Light Reflectance Value point as possible to aid navigation. Desk chairs are fully adjustable and the chosen model won the Excellence Award for Ergonomics. Being remanufactured, these high quality chairs were a comparable price to short-lived contract furniture alternatives. On each floor are stand-up working benches, which allow staff to change their posture and work in a standing position. A stand-up meeting room enables meetings in a different posture from sitting and have been found in other buildings to reduce meeting times. Bespoke team spaces were created in the open plan office through the use of team-specific carpet tile colours which, alongside the blue walkways, created “virtual walls”. Each team space has desks arranged to suit the size and workflows of the team. Soft furnishings for the in-team breakout spaces are also unique to each team. Biophilia refers to the innate and genetically determined affinity of human beings with the natural world. A range of medical studies have demonstrated that human health and productivity increases when natural elements are incorporated into the working environment. Natural elements in the Public Health Wales Cardiff office include timber effect desktops and storage units, wooden screens, warm natural colours, and clear views across the open plan office to the sky and surrounding landscape. Remanufacturing and refurbishing provided a significant cost benefit, enabling Public Health Wales Cardiff to achieve value for money and reinvest some of the savings in the 6% new furniture, all stylish quality items made locally which will last longer and perform better than cheaper alternatives. It also saved PHW on removal and disposal costs for its old furniture. Remanufacturing and refurbishing breaks the cycle for government bodies of having to accept the lowest cost new items which locks them into an institutional aesthetic, poor styling, poor ergonomics, short lifetime and poor sustainability (as these items cannot be remanufactured). Rype Office helps clients to create beautiful, productive offices at substantial cost savings through good design and by using remanufactured and sustainable office furniture. Contact: Greg Lavery at Greg.Lavery@RypeOffice.com or phone 079 0016 3409. For a literature review on Biophilia see Grinde, B., Grindal, G. 2009 Biophilia: Does Visual Contact with Nature Impact on Health and Well-Being? Int J Environ Res Public Health. 2009 Sep; 6(9): 2332–2343. Published online 2009 Aug 31. Accessed 5.3.16 at http://www.ncbi.nlm.nih.gov/pmc/articles/PMC2760412/.